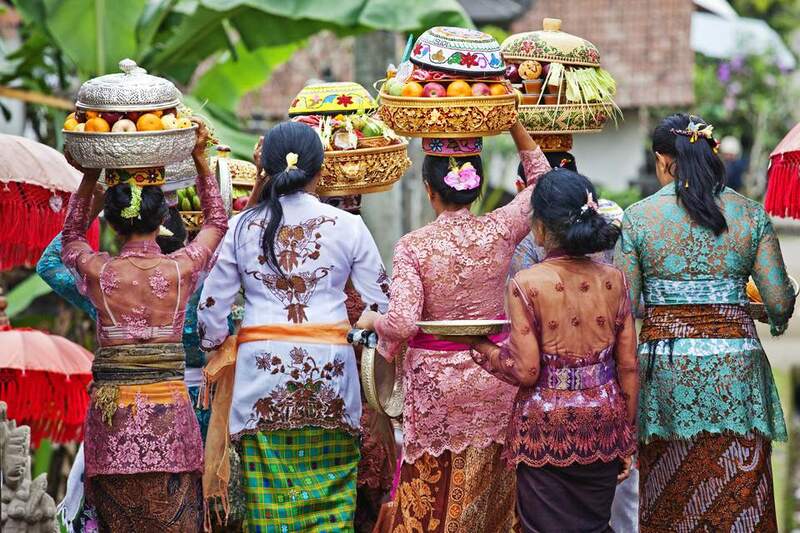 The laid-back town of Ubud is considered by many to be the epicenter for arts and culture in Bali. Ubud (pronounced “Ew-bood”) has developed a reputation as a place with a positive vibe, possibly explaining why so many artists and naturalists have settled in the lush, green areas around town. The shady, green Ubud Monkey Forest is the most popular stop for tourists in the town of Ubud itself. Hundreds of playful and interactive Macaque monkeys call the sacred forest home and roam freely around the tree canopy and temple complex. The influx of tourism in Ubud mixed with the proximity of so many artists has caused a lot of unique boutiques and shops to open. Unlike the tacky, beach-tourist feeling of shopping in Kuta, Ubud provides a much more sophisticated experience. Local shops are filled with unique and beautiful crafts, artwork, carvings, jewelry, and gifts to take back home. The sprawling, indoor Ubud Market caters mostly to tourists in search of cheap souvenirs. Be sure to haggle prices - negotiation is expected - or you may end up paying triple what something is worth. Be sure to check out the Ganesha Bookstore, considered the best second-hand bookstore in Bali, if not all of Indonesia. Ubud is known as a hothouse for fine art in Bali. It’s all down to the town’s royal family, which has traditionally patronized artists. The King of Ubud himself co-founded the Pitamaha Artists Cooperative in 1936, which was responsible for the cross-pollination between traditional Balinese art and Western art (represented by the expat artists Rudolph Bonnet and Walter Spies, two westerners who settled in Ubud). You can see the development of Ubud fine art through its collection of museums: the Blanco Renaissance Museum (pictured at the left) and the Museum Puri Lukisan, among others, feature two visions of Balinese art, the former a one-man perspective, the latter a more general overview of the 20th century and its artistic output. Ubud has spilled out into its tiny surrounding villages, but the growth has not ruined the natural setting of the beautiful surroundings. Green rice fields still blanket much of the area and can easily be reached by foot or on bicycle. The fields may be hiked along a twisting path for miles through tiny, thatched-roof villages. You will find the start of one of the trails just past the small market outside the "top" entrance of the Ubud Monkey Forest. Hiking these tranquil fields in the morning to the sounds village life beginning is something you will never forget. With scores of holistic medicine practitioners now living around Ubud, it is no surprise that so many spas and meditation centers have opened up. In town you can easily find all types of Eastern and Western massage centers, reiki healers, herbal medicine shops, and even acupuncture practitioners. The Bodyworks Healing Centre was the first of such places and has been providing natural healing to the local people long before Ubud was on the tourist map. For a more upscale wellness experience, check out the Spa Alila at the Alila Ubud just ten minutes' drive out of town. A strange, natural phenomenon occurs each evening just north of Ubud in the village of Petulu. Thousands of white herons arrive here around 6 p.m. and prepare to roost for the night before flying off again in the morning. The birds first began coming here after a communist massacre in 1965 but no one is sure why they continue to return. Local lore holds that these are the souls of those that were killed. Such a predictable gathering of these large and beautiful birds is a spectacle not to be missed. No visit to Ubud is complete without seeing at least one traditional dance performance. Although the performances are very tourist-oriented, this is a great opportunity to see classic Hindu legends being told through dancers in colorful, traditional costumes. Ubud Palace is a popular place providing shows nightly as well as Pura Dalem which has twice-weekly shows and fire dances performed outside. Ubud and the villages in the surrounding area contain dozens of examples of beautiful Hindu Temples. Most temples are free to visit or ask for a small donation. Proper attire is required, although many temples will loan or rent a sarong for your visit. Pura Penataran Sasih in nearby Pejeng is a charming temple containing the largest bronze kettle drum in the world. The Bronze Age drum is known as the "Moon of Pejeng" and dates back to 300 B.C. Only 10 minutes south of Ubud lies one of the most sacred sites in Bali: Goa Gajah. Also known as the Elephant Cave, this Hindu site dates back to the 11th Century and was nominated as a tentative UNESCO World Heritage Site. ﻿Although technically an hour north, many people visiting Ubud make at least a day trip to the Kintamani region. Kintamani in North Bali is home to Mount Batur and some of Bali's best scenery. Mount Batur is an active volcano that regularly smolders and surprises visitors with minor eruptions. The largest crater lake in Bali fills part of Mount Batur's caldera while small villages cling to the rim. The views of Kintamani from the nearby village of Penelokan are well worth getting outside of Ubud for a day. For those with lots of energy, a beautiful sunrise can be enjoyed from the summit of Mount Batur. Travel agencies around Ubud provide early pickup and a guide for the two-hour trek to the top of the volcano.